A prominent Yemeni rights group has documented heavy damage from ground fighting and airstrikes to at least 34 archaeological sites over the past four years and urged the international community to protect Yemenis' "collective memory." In a lengthy report titled "The Degradation of History" released Thursday, Yemen's Mawatana Organization for Human Rights collected the testimonies of over 75 people working at archaeological sites and monuments that came under attack. 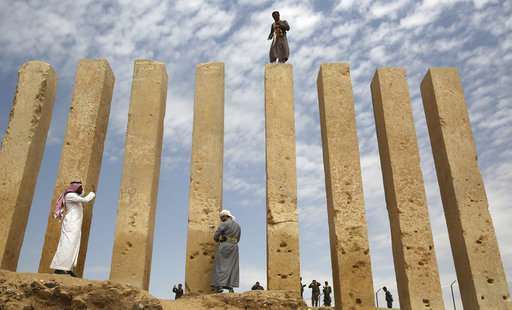 The sites are located in nine governorates including the capital Sanaa, Aden, and the eastern governorate of Marib. "The war in Yemen has impacted everything and has not spared the lives of Yemenis and their cultural property, including their rich history, unifying culture and collective memory," said Radhya al-Mutawakel, who heads Mawatana. 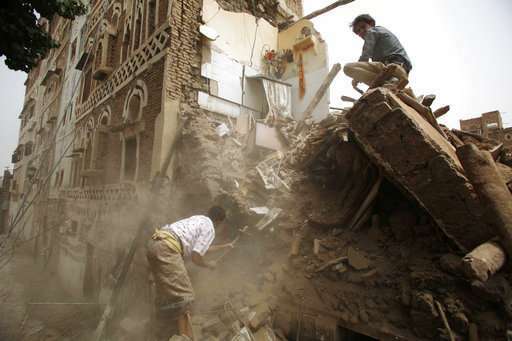 "It is not only a loss for Yemenis, but also for the cultural heritage of all peoples." The report covers airstrikes and other attacks since mid-2014, when Yemen's Houthi rebels descended from their highlands and occupied most of the northern region. Houthis forced the legitimate government to flee the country and seek military intervention from gulf neighbors. In March 2015, a Saudi-led coalition backing the government waged an extensive air campaign against Houthis and imposed a land, sea and air embargo. Within a few months, the coalition pushed the Houthis out of the southern region while the north remained in the Houthis' grip. Among the sites that have been damaged is the Old City section of the capital Sanaa, which is on the UNESCO list of world heritage sites. It has come under heavy airstrikes several times that have demolished many of the area's ancient buildings. The Mawatana organization accused all parties to the conflict of having "a hostile attitude toward history." It urged the international community to take responsibility for the protection of the cultural heritage of Yemen saying that parties are acting with impunity because of a lack of accountability. It added there is a need to place archaeological sites and monuments on an "enhanced protection" list adopted by the 1999 Hague Convention to prevent attacks against them and protect them from being used as military barracks or sites. The report also points to the war's impact on the massive Marib dam, which is nearly 3,000 years old and one of the world's oldest. Built of stone cut from the mountains, Yemenis take pride in the dam because it is a symbol of their ancient civilization. The northern gate of the dam was struck in May 2015 by coalition forces as Houthis took positions near the site. Baraqish was a religious and commercial hub in the 5th century B.C. It features prominent temples and was a center for Yemen's famed frankincense trade. Houthis took control of the site in mid-August 2015. Mawatana quoted witnesses as saying they turned the site into a place for weapons caches, causing the coalition to target it more than once. The Houthis also booby-trapped the sites, according to the report. Other sites mentioned in the report include the fortress at Kawkaban, the al-Hadi mosque in Saada and the military museum in Aden. Two Taiz landmarks—the al-Sudi and al-Rumaymeh domes—were totally destroyed by extremist groups, according to the report. In Dar al-Hajar palace in Lahj, Houthi rebels used artillery and tanks to shell the sites, causing extensive damage.